My most memorable and rewarding travel “Hit” is my most recent trip to India as part of the Painted Peacock Project. 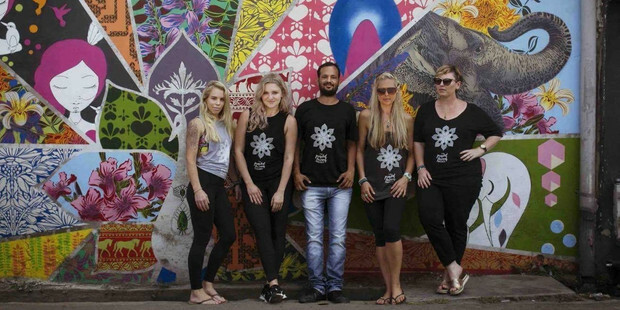 The PPP was founded by myself and three other talented New Zealand artists/designers: Cathy Pope, Ema Frost and Sacha Stejko, with our fifth member, Rajesh Soni, based in Udaipur. We taught art-based workshops at Badi Primary School on the outskirts of Udaipur. We wanted to take our own skills and pass these on to kids who would never otherwise have such an opportunity. The experience was absolute magic, with the kids super-engaged, and in awe of learning something completely fresh. Bright eyes, high fives and many selfies later, we emerged from the school feeling exhausted, overwhelmed and truly humbled. As a gift to local community, we created a large outdoor Indian inspired piece of artwork. This took place over the course of two days, right in the heart of Udaipur. It was very hot, busy, loud, and crowded, (rickshaws, scooters, cows, donkeys, dogs and inquisitive locals) all stopping in to see the action. So many beautiful smiles, from so many beautiful people, now that’s a hit. I flew from Auckland, via Sydney and then on to New Delhi with my friend Sacha. When we arrived in Sydney, the plane ended up being really quite late, and so time was thin in terms of making our next flight. All the people on board who were flying up to Delhi with Air India were hustled off the plane rather swiftly and chaperoned over to our next awaiting plane. Our first time in India, what a feeling it was boarding that flight, knowing that when we got off, we’d be somewhere so far away and exotic. As we stood waiting for our baggage at Delhi airport, time began to drag on, and then after about an hour of waiting and watching passengers head off through the exit gates, I recognised a few faces from our first flight, still waiting for their bags. To cut a long story short, everyone left standing around were the group of Kiwis from the very first flight. The airline had left all our luggage in Sydney.